Yesterday I told Part 2 of The Great Birthday Date. If you didn’t read that one, you might want to take a few minutes to read it first. Anyway, here’s Part 1 of my personal Great Date story. Enjoy! My first marriage unexpectedly fell apart the summer before my 35th birthday. To be honest, I don’t remember much about being 35, or 36 for that matter. Those years are lost to the blur of emotions and trying to pick up the pieces of my shattered life. But as I drew closer and closer to my 37th birthday, it was as if my soul had begun to awaken again. The summer I was 36 marked two years since I had first gone into receiving Christian counseling. Generally, we talked about how to function as a single parent, learning to forgive, letting go of what I couldn’t control, giving my fears to God, among other things. However, now that I reached the two year mark of single parenting and the divorce was officially over and done, my counselor began to suggest that I might soon be interested in dating. Initially, I was put off by the very idea. Already rejected once, I couldn’t envision putting myself and my children through something like that again. However, my counselor encouraged me to think and process about whether or not I might truly want to live the next 50 years alone … and at 36 years old, the possibility of living another 50 years wouldn’t be all that unusual. It didn’t take much thinking for me to realize deep down I wanted to have a special relationship with one man, a relationship in which we loved and cared for each other while living life together. It’s a normal desire for any person to have. Despite my experience with my previous marriage and divorce, my longings hadn’t really changed. And yet, even as I admitted that I had the desire, I was scared of the very idea. I felt anything but lovable. I felt used and discarded, like the old clothes at the Goodwill Stores. Sometimes there are treasures for the taking in those places, but you gotta look through a lot of junk in order to find them. And deep down, my own sense of self-worth was beat up. I felt like I was just another piece of tossed trashed, not a rejected treasure waiting for someone else to realize my true worth. Who on earth would want to love a woman like me? I remember during that summer before my 37th birthday doing a lot of soul-searching, praying and asking God to teach me about how to be a woman of worth, to be satisfied with His love whether or not any man ever loved me again, and to grow in my own self-respect so that I could reflect His great love. Between my counselor, the books and the prayers, I was approaching this cautious place in the very depths of my soul in which I wanted to be loved, and believed I was worth loving … and yet I was still fearful the second part wasn’t true. This was the state of my emotions in the month prior to my 37th birthday, which brings me to the actual “date” that was so wonderfully great. 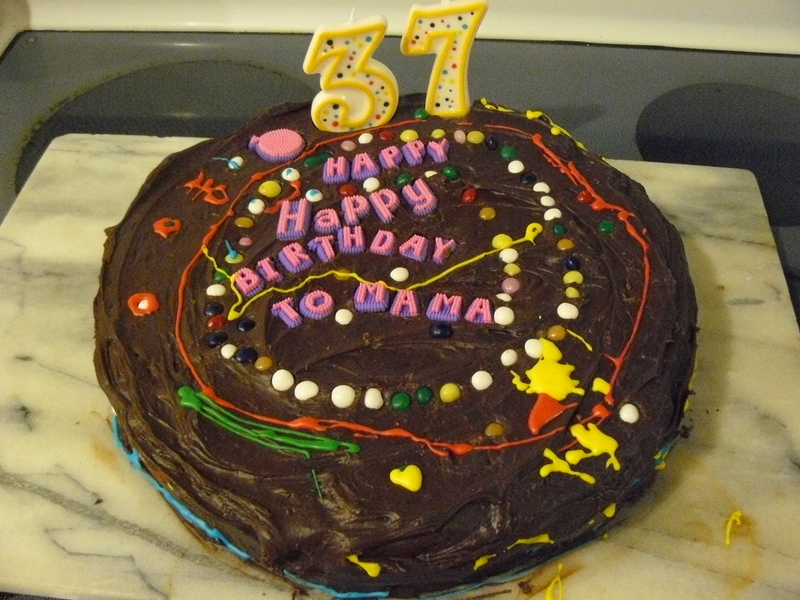 My 37th birthday started off with my three wonderful children decorating my cake. 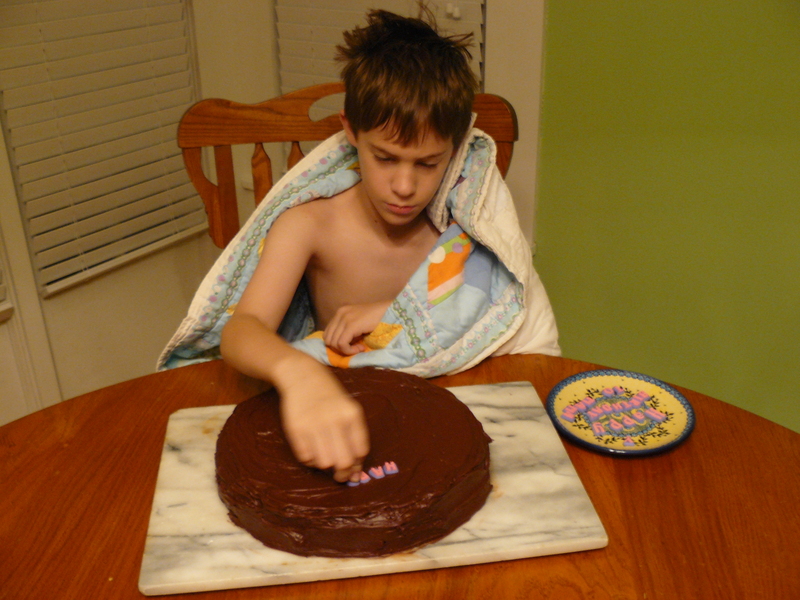 They had already asked me if they could do the decorating, so the night before I baked a cake. 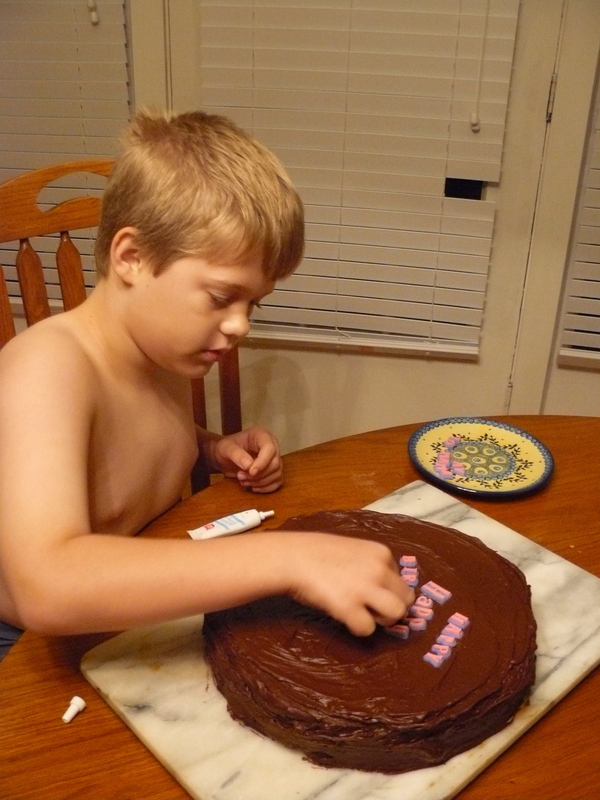 Now that it was cooled, they got up extra early so that they would have time to add the icing and decorations before school. Just look at those sweet babies of mine! Early morning hair, sticking up everywhere. Joel is all wrapped up in a quilt, still sleepy. 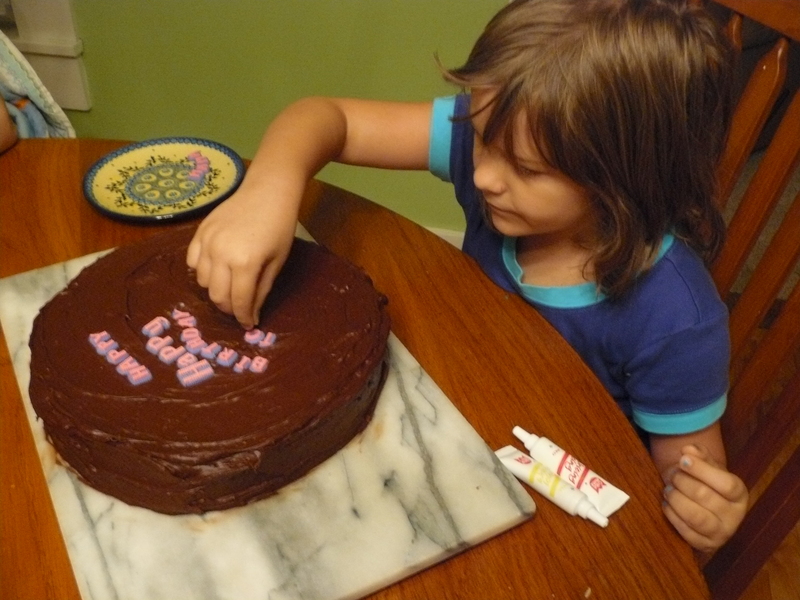 To this day, I get all mushy inside whenever I think about those wonderful children wanting to make me a special birthday cake. The cake was really enough to remind me that I was indeed a loved woman. But there was that question of worth. Was a I woman any man would ever again find worthy? I can’t say that was on the forefront of my mind on that morning, and yet it was the burning question in my mind for which I was seeking an answer from God. He didn’t fail to respond. That morning, I got to work and before I hardly sat down at my desk with my cup of coffee in hand, a delivery of a large bouquet of flowers arrived for me. I opened the card to discover they were from my sister. 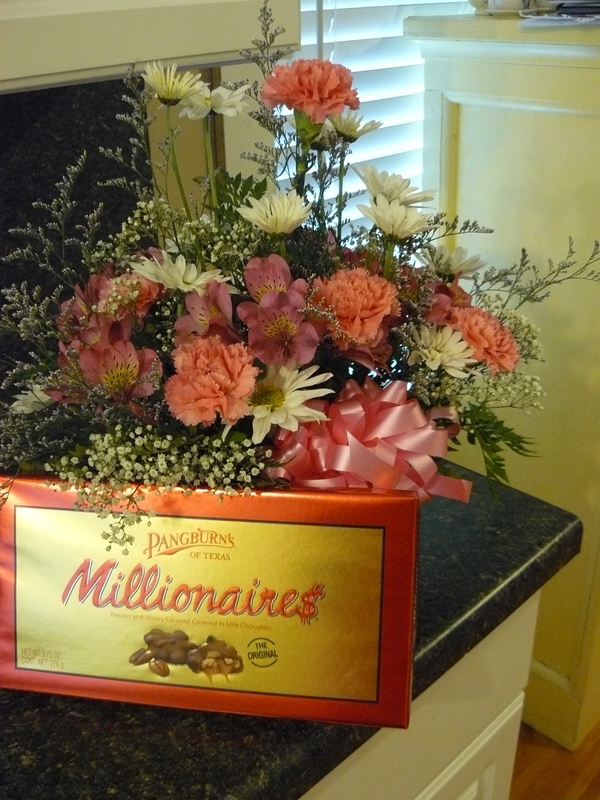 I was still gushing over the flowers when there was a short knock on the office door. There was my dad, standing in the hallway with a box of chocolates in his hands. “Chocolates for the birthday girl!” he grinned. I figured the birthday surprises were over, but in fact the day had only gotten started. My co-workers had unknowingly gotten together and each brought dishes to work so that we had a birthday lunch right there at the office … complete with cake and ice cream! I can’t remember what we ate, but I do remember laughing and enjoying the time with those wonderful ladies. Forget? Did you actually think I would forget the jewelry? You are worth much more than any of these gifts to me! There is more, much more to come. I looked over at the pile of mail. There were six or seven birthday cards and not a single bill or piece of junk mail to throw away. Everything that had arrived that day had been just for me. With tears already flooding my eyes, I began to open up each card and letter. Each card made me smile or laugh. Tucked away in a few were small bills of money. Others contained notes of love. But the last envelop I opened took my breath away. As I pulled out the card inside and opened it up, I saw a familiar handwriting and signature. My grandmother. The card was from my grandmother. But she had died nearly 3 years earlier. How on earth? Glancing to the left side of the card, I saw another handwritten note, but I had to wipe away the tears in order to read it. Mrs. Jean E. … My 4th grade teacher and friend. I had known her all my life and looked forward to her birthday cards since I was a tiny girl because most of the time there was a piece of gum included inside the card. There wasn’t any gum in this card, but that didn’t seem to matter because I had already received more than I ever imagined possible … right down to the birthday wish from my grandmother in heaven. I Am … the Lover of your soul. I created you, knit you together to be the exact person you are. My love for you is undying. I will never reject or leave you. I am with you always, looking out for you even when you don’t know it or understand My ways. And you are worth it. For as long as I live, my 37th birthday will remain my favorite. It was the year the Lord took me out on an amazing date, treating me to everything a woman’s heart could possibly desire. Within a month, Jon Hamilton would ask me to be his girl. I’m glad I decided to dare to love again because it worth the risk. But more than that, I’m glad I learned that God wants me to be His girl first. And that His love for me is more perfect and wonderful than any other love a girl could ever want. Do you have a Great Date Story to share? If so, you could win a copy of the book $10 Great Dates as well as a crisp $10 bill to use on a new great date adventure. Contest rules are easy: just share your favorite great date story, either in the comments section of my blog or on your on blog (please ping back to me). Hurry! The last day to enter is August 31st! Next Article Time is Running Out! Enter Today! Your grandmother’s card!That’s the most amazing part for me. Great story, great pictures. It sounds like you had an amazing day. Love it. Absolutely love it!!!! What a great story! Brought tears to my eyes reading all the reminders that you were loved and never forgotten! Beautiful story. Thank you so much for sharing and reminding all of us how deeply and personally God loves each of us.